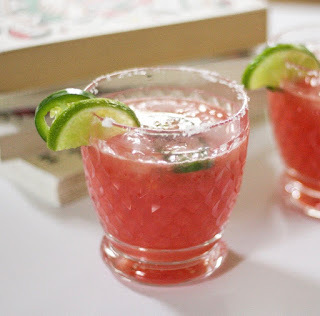 This Watermelon Jalapeno Margarita is a spicy and sweet cocktail that you will be begging for all summer long! I made a batch today and just can't get enough. Mix all ingredients in a large pitcher and stir gently. Press a few of the jalapeños with your spoon to add a little extra spice. Add a few ice cubes to a glass for immediate drinks or let the pitcher chill in the fridge for a few minutes. Before drinking, add optional salt to the rim of your glass. Enjoy! Leave a comment below with your favorite cocktail recipe. If you try this recipe, let me know what you think!